To say that A Whispered Name is simply a mystery/thriller would be an understatement. Author William Brodrick has written a complex story with a wide range of intricate situations woven together. 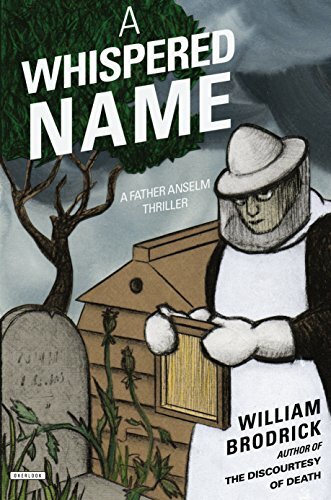 While Father Anselm, the protagonist, is doing the simple task of tending to his bees, he encounters a woman and an older man in search for Father Herbert Moore, a monk who died several years earlier. When asked why they seek him, the answer is vague, mysterious, and sets Father Anselm on a journey that takes him back to the First World War in search for answers that have been buried with Father Herbert and were perhaps never intended to be found. The woman, Kate Seymour, informs Anselm that she is seeking answers about the court martial of Joseph Flanagan—a court martial that Father Herbert sat on during World War I, prior to becoming a monk. Kate comments that “This was no ordinary trial . . . It had a meaning . . .” and with that cryptic remark, Kate and the elderly man do not remain, but leave Anselm with a worrisome task: to determine what the court martial was about and how Father Herbert became involved. And so the story begins its long, winding path to resolution for Father Herbert, Father Anselm, and a cadre of characters—most of whom are nothing but a memory. There are stolen identities and misplaced people, all of which need to be sorted out as Anselm pieces together this jigsaw puzzle of the injustice of one particular event. Through his research, Anselm encounters numerous characters who are also anxious to learn the facts of Joseph Flanagan’s court martial and bring this event to a close. The story wanders through a variety of points of view as the truth of the court martial unfolds, while at the same time forcing Herbert to face his own failings. These conflicts and movements through time is often convoluted. While it provides considerable information about the process of court martial in the British army, and this court martial in particular, it is nonetheless at times confusing. The confusion of bouncing back and forth through time eventually brings the reader back to the present where Father Anselm tidies up the information and as with all mysteries, the proffered clues and the revealed responses filter through the funnel of discovery, giving answers to questions while sorting out fact from fiction. Putting aside the sometimes confusing march through time, this is a good read, especially to enjoy Brodrick’s use of words that so visibly describe settings and get into characters’ minds. The reader will ride through the story on the shoulder of each character, and that makes this a fascinating read.